Happy Friday! The classroom decorating and organizing has finally been completed. Whew! The kiddos come in next Wednesday, but we have in-service days Monday and Tuesday. I'm super nervous about everything but definitely excited! 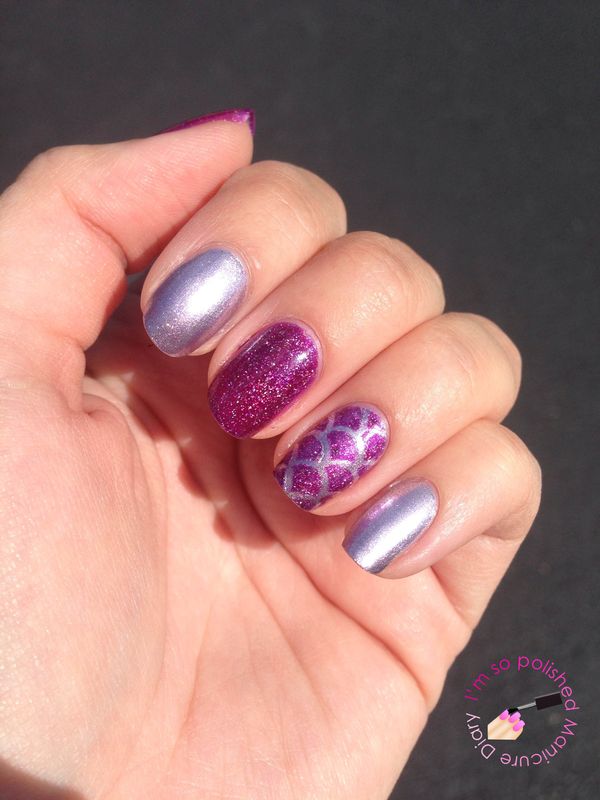 I totally had this detailed mani in mind for today, but when I got home I had a package I ordered from Julep and as soon as I saw Geena I knew it needed to be on my nails immediately. 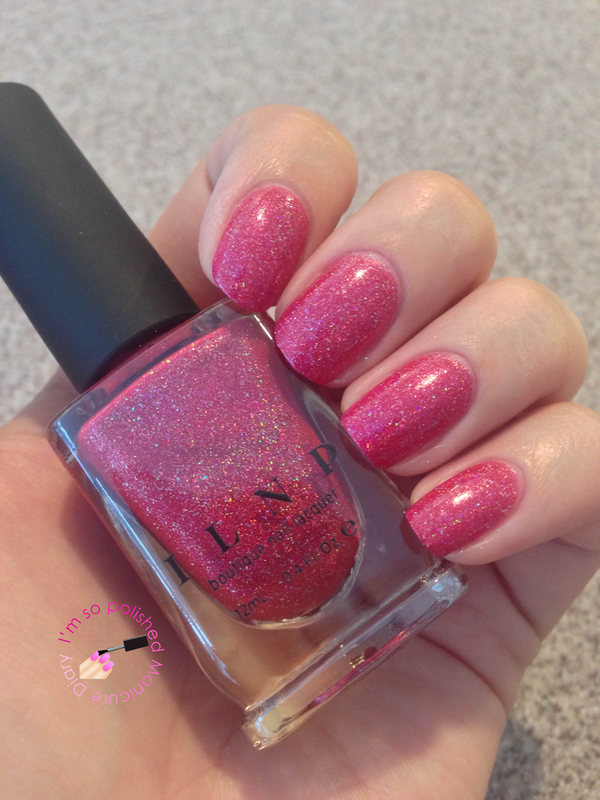 Geena is part of the 2015 birthstone collection and it is a rose quartz iridescent shimmer. This one is pretty sheer, so I recommend layering it over another color. 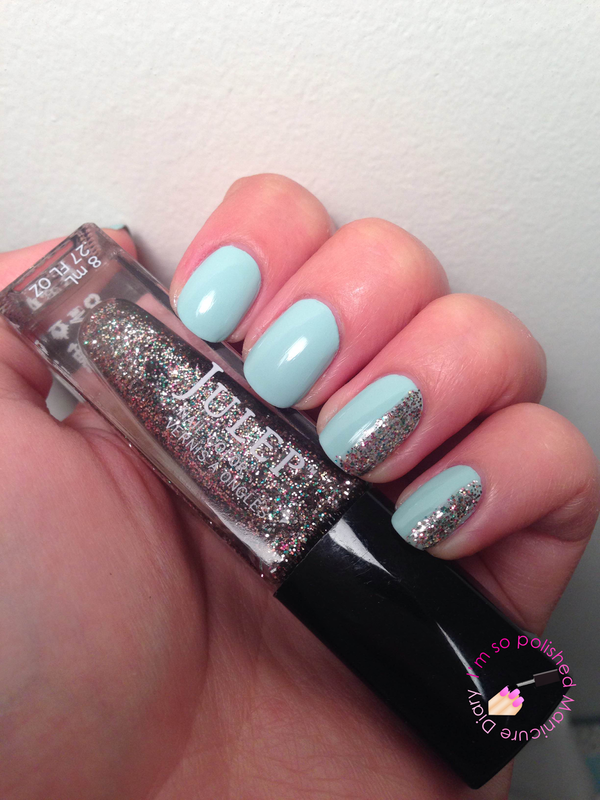 I used it over Deborah Lippmann Whip It and love how it came out! I will for sure have something fun on my nails next week for the start of school! Hope you all have a great weekend. Get outside if you can, the weather is supposed to be gorgeous! Hey everyone! We're halfway through the week and my classroom is nowhere near close to being fully set up. Ugh. I wish it could just magically arrange itself. Wouldn't that be wonderful? Today I have a first impressions review of Baublebar. I've always heard great things and have browsed their website many times, but never made a purchase. Recently they were running a promotion that I couldn't pass up. The offer was a free necklace (out of a selection of about six) with your first purchase from Baublebar. I ended up choosing this adorable giraffe ring tree and the clear Crystal Zodiac Necklace, which unfortunately I can't find on their website. Let's start by talking about the packaging. Everything about Baublebar's packaging is perfect, from the tissue paper to the envelope with the packing slip inside. The necklace and ring tree were wrapped in bubble wrap and placed inside their own bags. They also included two jewelry pouches! And now a look at the goodies! I'm usually not a statement necklace kind of person, but this one is so pretty! I can definitely see myself wearing it with a lot of different outfits. And how cute is that giraffe?! I can't wait to put some rings on it and display it on my night table. Overall I'm super impressed with Baublebar. My order shipped out quickly and everything was nicely packaged. It felt like a lot of care was put into that box. I would absolutely order from Baublebar again. There are so many beautiful pieces to choose from, I don't know how I'll decide what to get next! 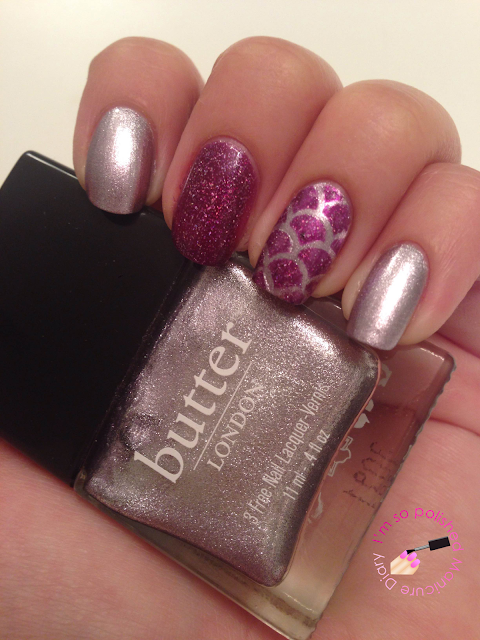 Happy Mani Monday! Today's post is coming a little late because I spent a good chunk of my day at school trying to get my classroom organized. I still have a lot to do! So as I was getting set up to paint my nails and pick a color, the BF asked if he could choose my polish! It's so cute when he takes an interest in my nails. 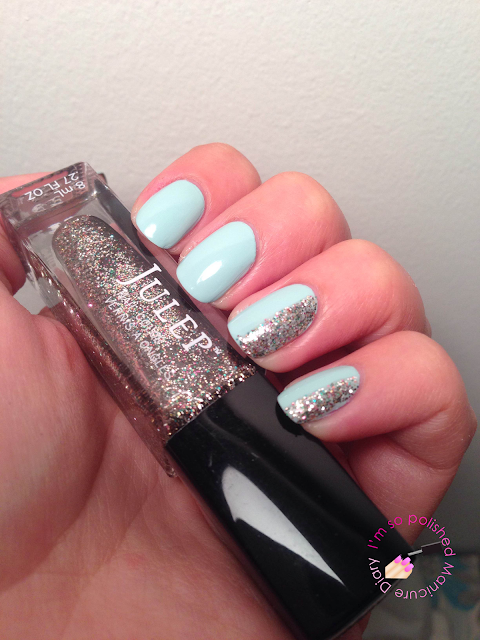 He picked out Julep Shelly, a wintermint creme, and Julep Mila, a multi-colored glitter. I've heard people complain about Shelly's formula, but I had no issues with it. I think the key for a smooth application is giving the first coat plenty of dry time before putting on the second. I'm hoping to do something more fun with my nails this Friday, I just haven't had much time the past couple of weeks with moving and getting ready for school. Hope you all have a good week! Happy Friday! We made it through our first week at the apartment and everything has really come together nicely. All of our clothes and things are put away and all of the IKEA furniture has been assembled. Well, except for a coffee table because the hardware was missing from the box. We're planning a trip out to IKEA this weekend to get the pieces. I'm so happy to be getting back into painting my nails. I only went naked for a few days but it felt like forever! Today I pulled out Julep Nellie, a gorgeous fuchsia creme. I've had this one for a long time and forgot how amazing the formula is, two coats for for full opacity. I did some dot accents with Marc Jacobs Gatsby. Happy Mani Monday! Today's post is coming a little late because I was out all day taking care of some last minute things for the apartment. I can't believe the move is happening in less than a week! The BF and I are really excited. 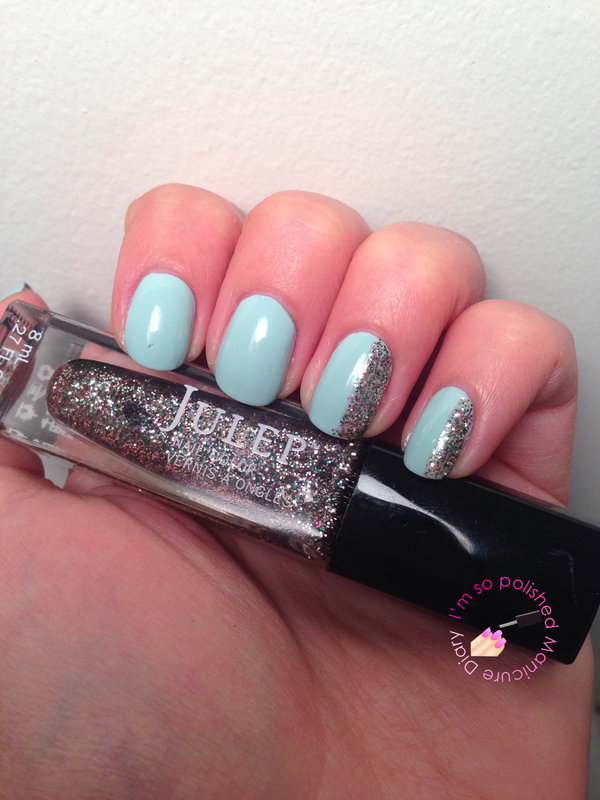 For today's mani I used Julep Taylor, a gorgeous blue with a hint of purple. This one has a great formula and it was easy to work with. I probably could have gotten away with one coat, but I used two here. The glitter on my accent nail is Julep Amira, a silver chunky holographic glitter topper. I used an eyeshadow applicator to really pack on the glitter. I finished up that accent with some little blue rhinestones. These nails kind of make me think of a peacock but I love it! Hey everyone! 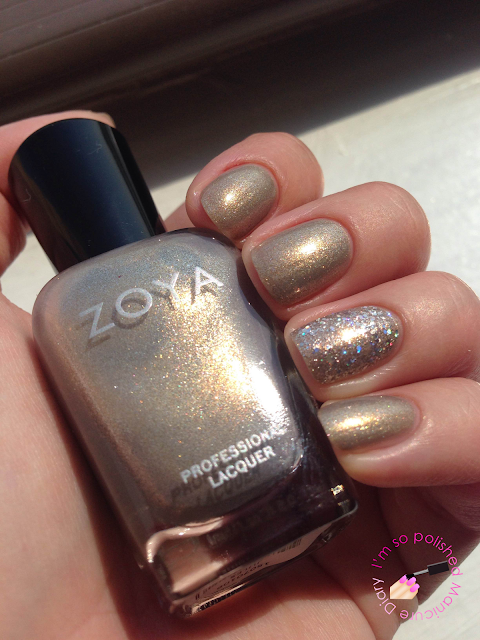 Today I have for you a preview of Zoya's fall 2015 Focus & Flair Collections. I know, fall already?! 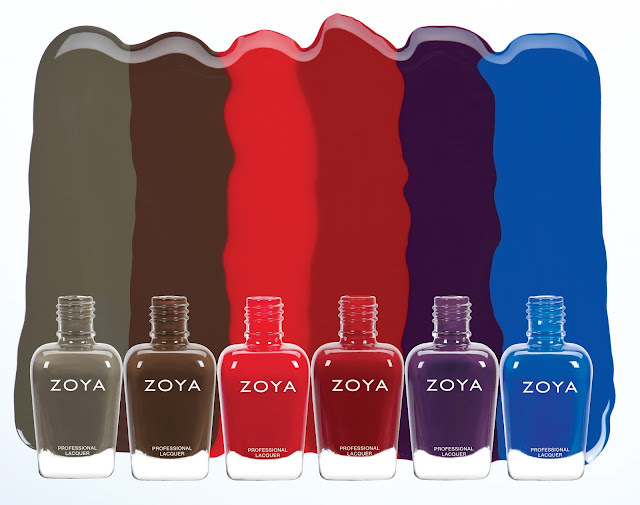 I promise these gorgeous shades will get you excited. Charli - a dusty taupe cream with a hint of green, a perfect neutral. Desiree - a classic sable brown cream with a balanced (neutral) undertone. Hannah - a clear, classic red cream with a balanced undertone. Janel - a deep red cream with a rich warm undertone. Lidia - a rich eggplant cream with a blackened purple base and just a hint of red resulting in a color that is wearable for most skin tones. Sia -a true royal blue cream. This is a highly pigmented shade, so be sure to apply a base coat in order to prevent staining. 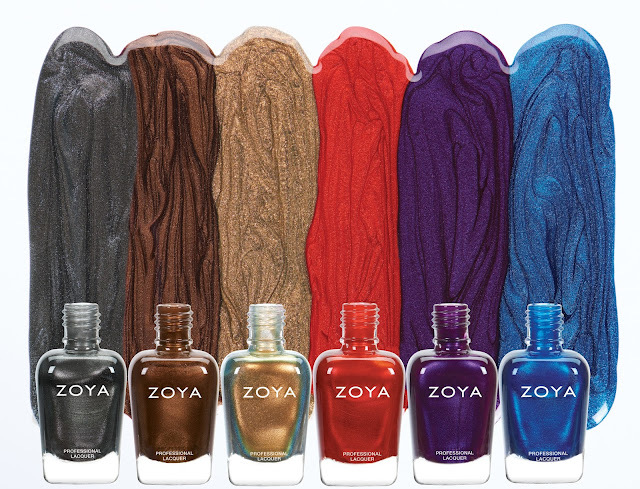 The Zoya Flair collection features six, jewel toned liquid metal shades. The unique micro-grind metallic pigment of this collection is fully blended into a vibrant base, creating the effect of brilliant colored melted metal! Tris - a blackened, brushed nickel liquid metal. Cinnamon - a classic bronze liquid metal, originally designed for Zang Toi NYFW F/W15. Aggie - a gold holo-flip, liquid metal with bronze micro glitter. Sheer enough for layering with one coat or fully opaque in three coats. Ember - a deep fiery red liquid metal with enough blue to be wearable for all skin tones. 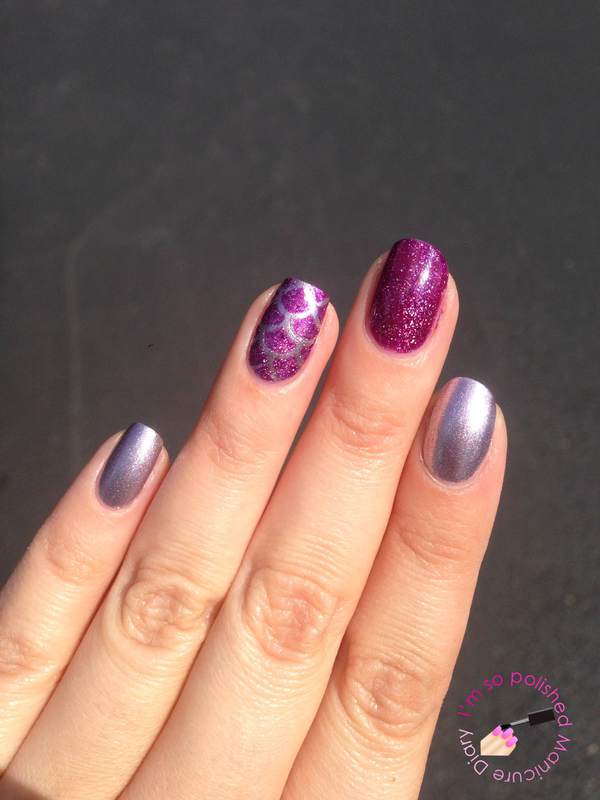 Giada - a purple liquid metal with a hint of fuchsia pearl. Estelle - a blue on blue liquid metal with a blackened base. The Focus & Flair Collections are available for pre-order now from zoya.com for $9 each. 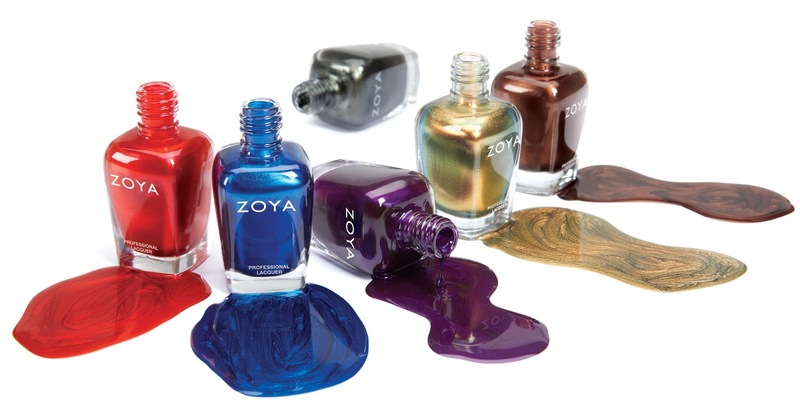 Which polishes will you be picking up? !